Rain has been spotty in Northern Illinois this year and the extremely steep hill at the Rock River Riders Clubgrounds east of Polo, IL. quickly turned to powdery dust when the big turnout of over 150 riders began challenging it. Other than the dust, the weather was perfect. The event was dedicated to Jackie Knipple who passed away last year, wife of long-time club member Bruce Knipple. 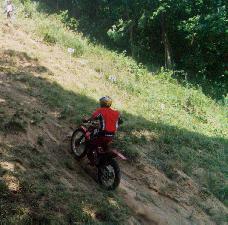 Illinois Expert Trials rider Jesse Wellenstein not only rode his trials bike up the hill but back down. 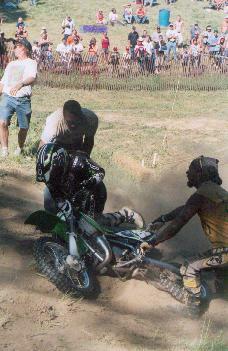 Super Senior rider Marv Wiemken tried to duplicate Jesse’s feat but ended up in a big crash at the bottom. Fortunately, he wasn’t hurt. Kevin (James) Bond showed his sense of humor by using number 007. The pushrod class really earned their trophies by riding a heavy bike on a steep, dusty hill where the horsepower of a big 4-stroke didn’t really provide a benefit. 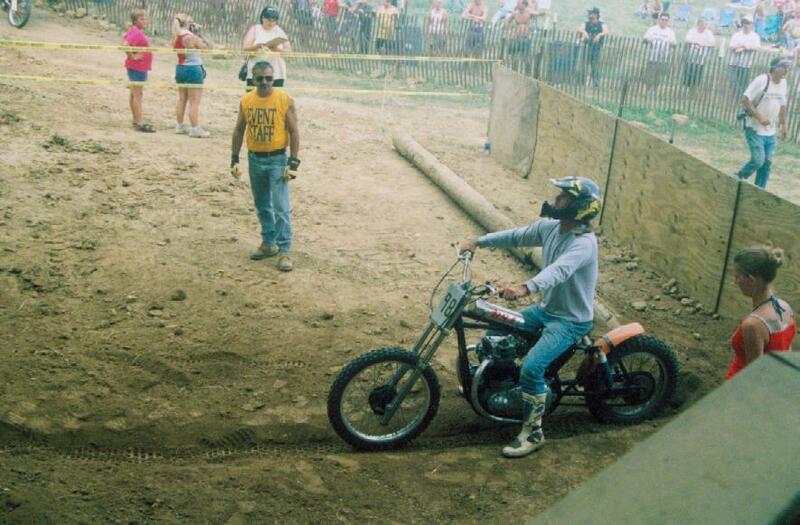 Bill Myers gave it a big effort, even riding in the King-of-the-Hill final event where he had to borrow a bike from the Baileys because his quit running. The myth that 4-strokes are less powerful than 2-strokes was dispelled by Mike Raugh when he set fast time of the day on his Honda with a 3.590 sec. ride. 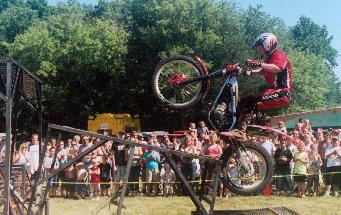 During the intermission between rounds, Jesse Wellenstein entertained a large crowd of spectators with a trick riding demonstration using his trials bike and a portable trials set-up he brought out. Some pictures showing Jesse’s skill are included. 201-250: 1. Mike Popham (Yam) 3.831 sec. ; 2. Chris Huzenga (Hon) 4.054 sec. ; 3. Shane Green (Yam) 4.409 sec. 251-450: 1. Paul Hackbarth (KTM) 3.986 sec. ; 2. Brent Stewart (KTM) 4.125 sec. ; 3. Kurt Kachmer (Hon) 4.273 sec. 451-600: 1. Mike Raugh (Kaw) 3.680 sec. ; 2. Lloyd Haas (Hon) 3.780 sec. ; 3. Paul Hackbarth (Hon) 3.873 sec. 601-750: 1. Lloyd Haas (Kaw) 3.801 sec. ; 2. Wade Schultz (Yam) 4.786 sec. ; 3. 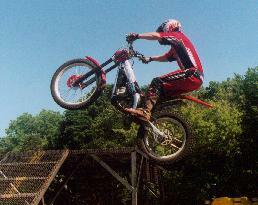 Daryl Johnson (BSA) 5.144 sec. 751-Open: 1. Wade Schultz (Suz) 3.657 sec. ; 2. Lane Schultz (Suz) 3.773 sec. ; 3. Bill Myers (HD) 3.952 sec. Sr 40: 1. Greg Haas (Hon) 3.986 sec. ; 2. Jeff Ness (Hon) 3.949 sec. ; 3. Don Sheridan (Hon) 4.332 sec. Open Pushrod: 1. Bill Myers (HD) 4.378 sec. ; 2. 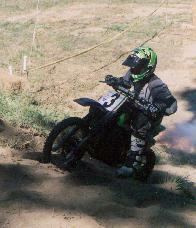 Daryl Johnson (BSA) 4.423 sec. ; 3. Nate Sinener (HD) 4.826 sec. 86-400 4-Stroke: 1. Mike Raugh (Hon) 3.590 sec. ; 2. Paul Hackbarth (Yam) 4.177 sec. ; 3. Rick Ness (KTM) 4.396 sec. Thanks to a lot of work by club members and the support of many sponsors, the hillclimb was a success with 160 riders contesting the various classes. Double points awarded at the championship were one reason for the excellent rider turnout on a very hot 95 degree day. Wade Schultz set the fastest time of the day (2.937 sec) to squeak by Tom Daniels (2.959 sec) in the Exhibition class and Bud Northrup had the shortest ride of the day with a 1 foot run to just break the lights and ensure that he would earn points in the Senior 50+ class. Braxton Stamm of Forreston is following in his dad’s footsteps with a good ride of 42 feet in the 50cc auto class for first place. Braxton’s father Mark Stamm was third in the 451-600 cc class with a nice 3.525 second ride. President Jamie Roberts directed major work on the hill before the event to widen it and add a lot of dirt at the top so that member Chuck Pilgrim could get his tractor and boom rig in place to haul bikes off the hill if they didn’t make the top. The hill crew really appreciated it. Member Tim Vock spent a lot of time the week before the event applying 13,000 gallons of water to the hill to keep the dust down and help traction since rain has been scarce. Many more riders made it over the top than at the June event. Thanks to the Polo Coop who lent us the water tank and United Rentals of Rockford who lent us a pump to get water from the creek running through the clubgrounds. 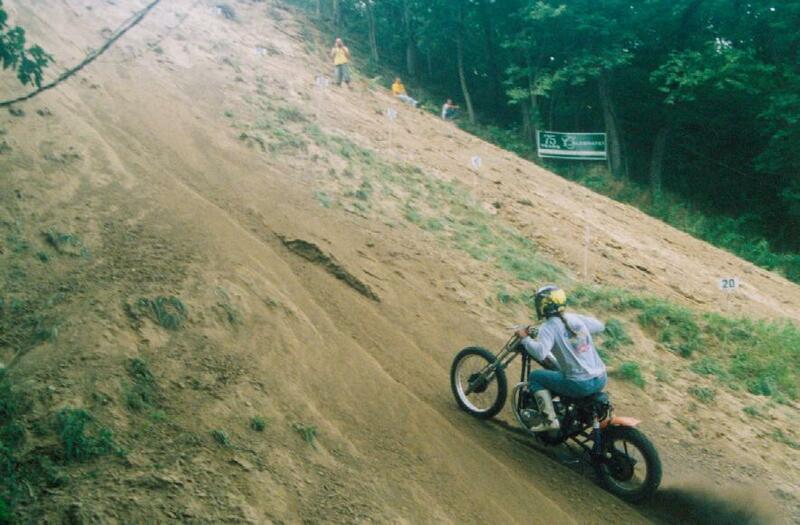 Despite the water, the hill quickly turned into a single groove that the rider had to stay in to make a good time. Steps on both sides of the groove required a momentary shutdown and that made the difference between first and finishing in the pack. This was a semi-pro event with an 80 % payback. Additional cash was provided by the following sponsors: Rock River Riders, Polo; Iron Horse Saloon, Savanna; First State Bank, Polo; Gray Excavating, Polo; Jeff’s Refs, Polo; Reliable Garage Doors (Randy Schoon), Polo; Powell Performance, Polo; Hunt Machine and Tool, Polo; Tim Vock, Polo; Douglas and Frye Motorsports, Sterling; Jamie Roberts, Oregon. Trophies were also provided by the Rock River Riders for all classes and goggles were presented to youth winners. Thanks to all the sponsors.